Avolon (Dublin), the global aircraft leasing firm, has announced a Memorandum of Understanding (MOU) for 15 of Airbus’ newly launched A330neo aircraft. 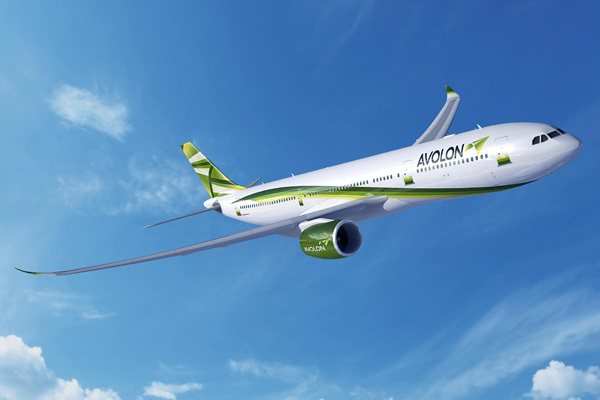 Avolon becomes a launch customer for the A330neo. The commitment was signed today at the Farnborough International Airshow 2014 by Dómhnal Slattery, Avolon CEO, John Higgins, Avolon President and Chief Commercial Officer and Fabrice Brégier, Airbus President and CEO. The A330-800neo and the A330-900neo are two new members of the Airbus Widebody Family launched in July 2014 with first deliveries scheduled to start in Q4 2017. The A330neo incorporates latest generation Rolls-Royce Trent 7000 engines, aerodynamic enhancements and new cabin features. Benefitting from the excellent economics, versatility and high reliability of the A330, the A330neo reduces fuel consumption by 14% per seat, making it the most cost efficient, medium range Widebody aircraft on the market. In addition to greater fuel savings, A330neo operators will also benefit from a range increase of up to 400 nautical miles and all the operational commonality advantages of the Airbus Family. This entry was posted in Avolon and tagged A330, A330neo, Airbus, Airbus A330, Airbus A330neo, aircraft leasing, Avolon, Farnborough International Airshow on July 15, 2014 by Bruce Drum. Boeing (Chicago) and GE Capital Aviation Services (GECAS) (Stamford), the commercial aircraft leasing and financing arm of General Electric (GE), announced today at the 2013 Paris Air Show a commitment to order 10 787-10X Dreamliners equipped with state-of-art GEnx engines, subject to the 787-10 program launch. Boeing looks forward to working with GECAS to finalize the details of the agreement, at which time the airplanes will be posted to the Boeing Orders & Deliveries website as a firm order. Boeing has been working closely with airline and leasing customers to define the key capabilities and features of 787-10X, which would be the third and largest member of the 787 family. The 787-10X under consideration would add approximately 15 percent passenger capacity over the 787-9 with superior fuel efficiency to serve medium and long-haul markets. Once finalized, these 787s will bring the total number of airplanes GECAS has ordered from Boeing to 598 since 1995, including 737s, 747s, 757s, 767s and 777s. To date, GECAS has taken delivery of 444 of the airplanes. This entry was posted in Boeing, GECAS and tagged 787-10X, aircraft leasing, Boeing, Boeing 787, Boeing 787-10X, ge capital aviation services, GECAS on June 17, 2013 by Bruce Drum. International Lease Finance Corporation (ILFC), a wholly owned subsidiary of American International Group, Inc. (AIG), announced today that it has exercised options to purchase 50 incremental A320neo Family aircraft from Airbus that were part of the agreement signed in April 2011 for 100 firm A320neo Family aircraft. ILFC was the first leasing company to order the Airbus A320neo Family aircraft and has the largest order position among aircraft leasing companies. Deliveries of ILFC’s NEO aircraft are expected to commence in 2015. Officially launched in December 2010, the A320neo Family aircraft incorporate greater fuel-efficiency and eco-friendly technology, providing reductions in engine noise and emissions. This entry was posted in ILFC and tagged aircraft leasing, ILFC on June 17, 2013 by Bruce Drum. Air Lease Corporation (ALC) (Los Angeles), the aircraft leasing company, has signed a contract for 25 A350 XWB Family aircraft, consisting of 20 A350-900 and five A350-1000, the largest member of the A350 XWB Family. ALC also has options for five additional A350-1000s. With this new order, ALC becomes the 35th A350 XWB customer and the order takes the A350 XWB backlog past 600 (to 617). Concurrently, ALC has signed a purchase order for 14 A321neo aircraft following an earlier agreement announced at the 2012 Farnborough International Air Show for 36 A320neo Family aircraft plus 14 options. With this latest confirmation from ALC, the lessor’s cumulative orders for the A320neo Family have reached 50, of which up to 34 will be A321neo models. ALC will announce engine selections at a later date. This entry was posted in Uncategorized and tagged aircraft leasing, ALC, aviation, leasing company, transportation on February 4, 2013 by Bruce Drum. BOC Aviation (Singapore), the aircraft leasing subsidiary of Bank of China, has placed a new firm order, signed in December 2012, for the purchase of 50 A320 Family aircraft including 25 NEOs. The order comprises A320 and A321 variants of both engine options. BOC Aviation will make its engine selection for the aircraft at a later date. BOC Aviation last placed an order for A320ceo Family aircraft in 2010. This order for A320neo Family aircraft will be its first for the new engine option. As an investor in aircraft, the Company seeks fuel-efficient aircraft that have a wide operator base and this order will further contribute to its growth. This entry was posted in BOC Aviation and tagged aircraft leasing, aviation, BOC Aviation, leasing subsidiary, transportation on January 16, 2013 by Bruce Drum. Jetairfly (Jetairfly.com) (TUI Airlines Belgium) (subsidiary of TUI Travel PLC) (Brussels) will lease two Embraer ERJ 190 jets under an agreement with BOC Aviation (Singapore), an aircraft leasing company. The two ERJ 190s will be delivered in the first half of 2013. Jetairfly’s ERJ 190s will be configured with 112 slim line seats in a single-class layout. The E-Jets will allow the airline to provide capacity more economically on lower-demand routes that are currently served by larger narrow-body equipment. The ERJ 190s are also intended to be deployed in winter markets where seasonal demand is better satisfied with 100-seat aircraft. Jetairfly.com is a brand name of N.V. Jetair. Jetair is the Belgian branch of TUI Travel. This entry was posted in Jetairfly, Jetairfly (TUI Airlines Belgium) and tagged aircraft leasing, BOC Aviation, Embraer, Embraer 190, Embraer ERJ 190, ERJ 190, Jetairfly, Jetairfly (TUI Airlines Belgium), leasing company, transportation, TUI Travel on October 4, 2012 by Bruce Drum. GE Capital Aviation Services Limited (GECAS), the commercial aircraft leasing and financing arm of GE, announced it will lease two Airbus A320-200 aircraft to a new customer, Tyrolean Airways (Innsbruck). Tyrolean Airways is now responsible for operating all Austrian Airlines flights. Austrian Airlines (Vienna) has become virtually a marketing name rather than an operating airline. Only one aircraft for legal reasons has been retained on the Austrian certificate. Otherwise all other Austrian aircraft and personnel have been shifted to lower-cost Tyrolean. Tyrolean is also dropping the Austrian arrow name. The aircraft are scheduled for delivery in early 2013 and will expand the existing fleet to around 80 aircraft. Copyright Photo: Rolf Wallner. Austrian Airbus A320-214 OE-LBO (msn 776) taxies at Zurich. 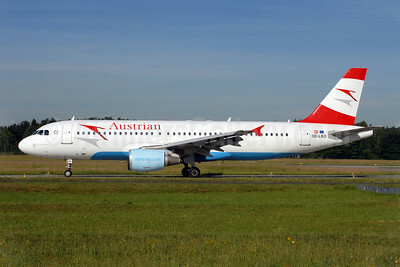 This entry was posted in Austrian Airlines, Austrian Airlines Group, GECAS, Tyrolean Airways and tagged 776, A320, A320200, A320214, Airbus, Airbus A320, Airbus A320200, aircraft leasing, Austrian Airlines, aviation, ge capital aviation services, GECAS, General Electric, OELBO, transportation, Tyrolean Airways, ZRH, Zurich on August 28, 2012 by Bruce Drum.